Laine Hardy didn’t even want to compete on the second season of the rebooted American Idol. He had already walked down that road once before, having been a contestant during the reboot’s first season. 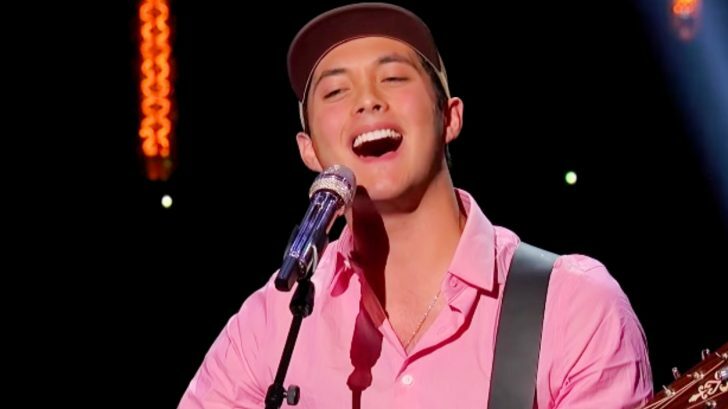 The Louisiana teen earned a ticket to Hollywood with his audition, but was eventually eliminated before reaching the Top 24. While Laine’s voice was clearly there, the one thing lacking was confidence. Since he held back too much, the judges felt he wasn’t ready to move on yet. And Laine knew that was true. Fast forward, and Laine returned to help his friend, Ashton Gill, when she wanted to audition for the second season of the reboot. Laine simply came along as her guitarist, but the judges encouraged him to audition as well. He did, showing an even more mature voice and a much greater sense of confidence than he had the prior year. The judges decided to give him a second chance and offered him a golden ticket to Hollywood. And of course, he accepted! So what happened once Hardy made it to Hollywood? There, he chose to do what he does best…offering up a slightly countrified take on a rock and roll hit. The song he chose to perform for Hollywood Week was The Black Crowes’ “She Talks to Angels.” Released in 1990, the track was a huge success, topping the Rock Tracks chart and peaking at the 30th spot on the all-genre Billboard Hot 100. It’s a song that actually has a strong country connection. Blake Shelton famously performed a cover of the song some years ago, and it’s a powerful performance to witness. Shelton opted to perform the song with a stripped down arrangement, giving it an even greater sense of vulnerability. The most popular video of his cover has well over eight million views, if that tells you just how much listeners love his rendition. Hardy followed in Shelton’s footsteps with his Hollywood Week cover of the song, opting to bring along his acoustic guitar to back him up. But we guarantee that no one was listening to the guitar…all the focus was on Hardy’s powerful voice and strengthened sense of confidence. He roared through his performance, prompting stunned and shocked reactions from the judges on more than one occasion. Later on, Hardy hits a few notes with a growl that will pierce right through you. Listening to the way he tackles this song with so much power, you’ll find it hard to believe that he’s the same shy teen from the reboot’s first season. Prepare to be blown away by Hardy’s talent when you witness his bone-chilling cover of “She Talks to Angels” below. His performance starts at the 1:44 mark in the video. After hearing that, the judges knew what they had to keep Hardy around a little longer…and he advanced to the next stage of the competition!